Here coils of 14 gauge steel are being fed to the mandrel where they are cold rolled into our standard 2.5"x2.5" tube. We are actually a little over stocked at the main plant in North Carolina. 26 and 29 gauge panels 15 colors. We thought it would be fun to show you the shop. You cannot see it from here but the roof is Superman red! Cleaning up before the crew heads home. Its starting to look like a building! Here is the Tyvek R15 insulation. You can clearly see the Mylar radiant barrier. Once its on it gets really quiet inside! Now the finishing touches, trim and doors. Power had not been run yet so we brought a generator. Here you can see where the owners bus will be parked. The customer had to move the bus so we could work! Here are some more pics of one of our latest projects. Not the greatest picture in the world, but here is the slab that went on the other side for the future RV cover. Here you can see the R15 insulation with radiant barrier beginning to go around the frame. We continued to edit the plan and try to take into account the elevation, placement in relation to the other building and the door arrangement. 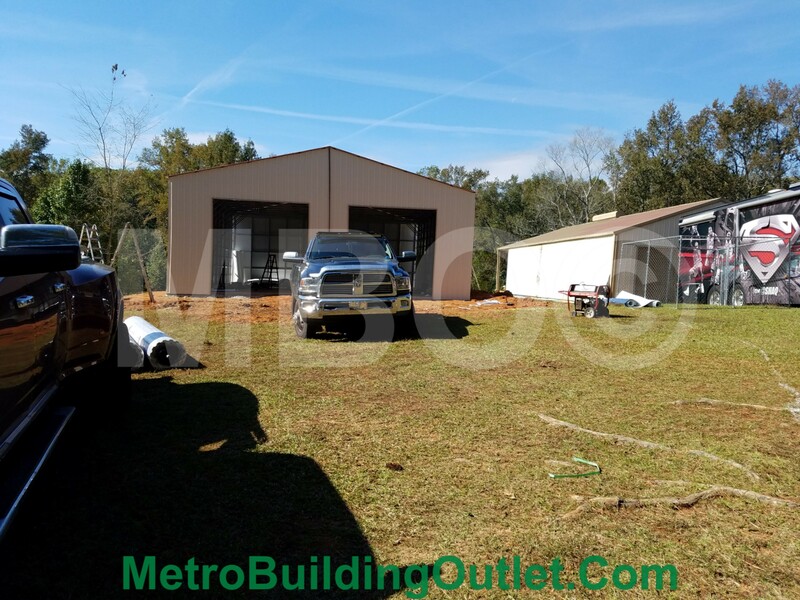 Making sure that the customers RV would fit between the two buildings at completion and that drainage would not be an issue were a part of the plan from the beginning. The customer provided us with makes and models of the vehicles and dimensions to make sure everything would fit. Our potential customer had originally seen this picture right here on The Building Journal and wanted to know if he could build the garage first and add the RV cover at a later time after more of the property was cleared and available. We decided that given the size of the RV and the layout that it might be better to build a separate RV cover at a later time. So we came up with this concept art that also incorporated the existing building already on the property. The customer was looking to store both the RV and 6-8 cars with a little room left over. They decided that an insulated 40x50x14 with a walk in door and (2) 12x12 doors would work. We will continue to add updates here and read below to see the story from the beginning. 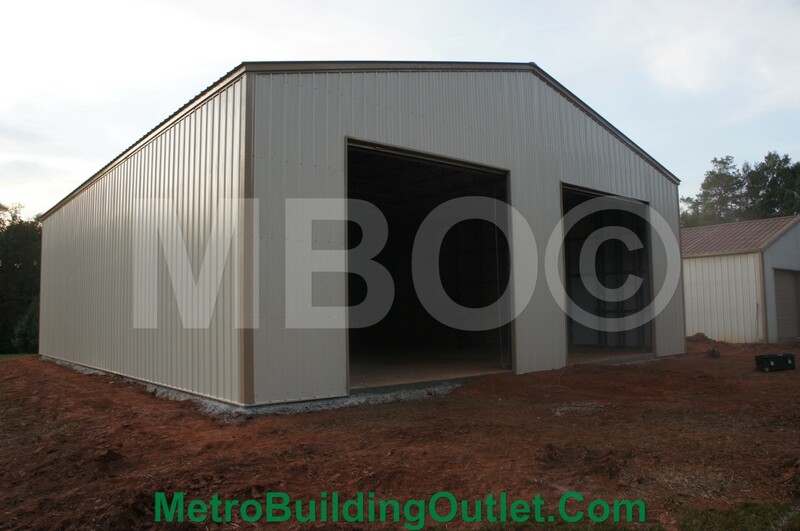 If you have questions you can email MetroBuildingOutlet@Hotmail.Com or call 918-258-5050. We are going to document this build from concept to completion to give you a better idea of the process. We were contacted by a potential customer in September about creating a garage for his collector cars. The customer had seen a previous building and wanted something similar but had slightly different needs. We drafted this initial concept to show how the building would be positioned in relation to an existing structure and also we planned for a future addition of an RV cover for their Motorhome. We will be going through the whole process from beginning to end right here and will add more in the days and weeks to come! Some great pictures of our interior side walls from the 40 foot clear span and 20 foot side walls that have been recently completed. An 40 foot clear span truss and commercial 14 foot side wall on 4 foot centers. Overhead windows are a great way to let in light! Introducing another new addition to the DIY home line up. This is BH#003. Keep in mind we can customize to better fit your needs. 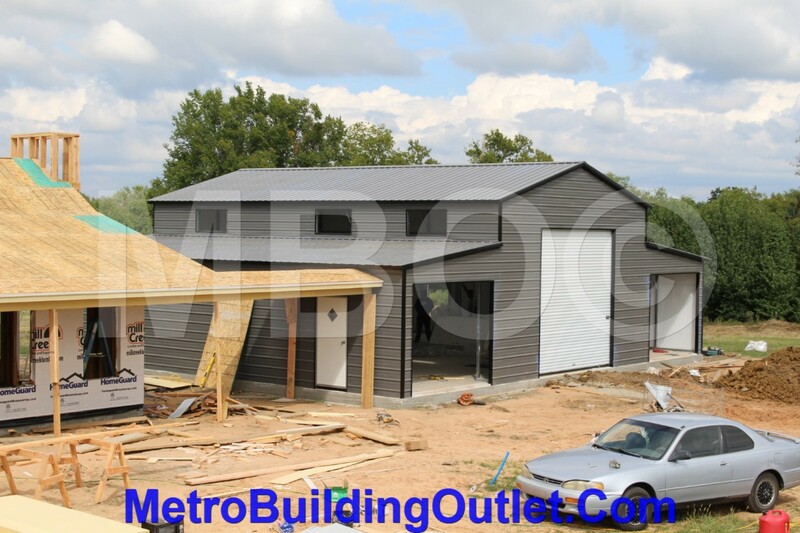 Send your questions to MetroBuildingOutlet@Hotmail.Com or call 918-258-5050. We are happy to show off the very simple plan for DIY BH#010. We have been quiet lately because we have been busy. There will be many more of these coming in the next few days and weeks and weeks so stay tuned. It is not new but this a far better example of our Hawaiian or king blue and the new lap siding. Lap siding is the same price as the vertical option and provides not only a great look but a stiffer over all panel. It is long over de but here is the newest floor plan. The basis is a 30x60 (1800 sq. foot) open plan, a 12x60 porch and a 20x30 2 or 3 car garage. With 4 foot on center spacing, lap siding or vertical sheeting, trimmed and finished porch , R15 insulation with moisture and radiant barrier all for just $40,000+ sales tax. As with everything that is an installed price in all of the central states (call for northern and Florida pricing). Also as with anything this is totally customizable so if you want to layout a special interior or strip down to just the basics and do everything yourself (It is possible to do a bare shell of just the 1800 square foot house for under $14,500+ sales tax). 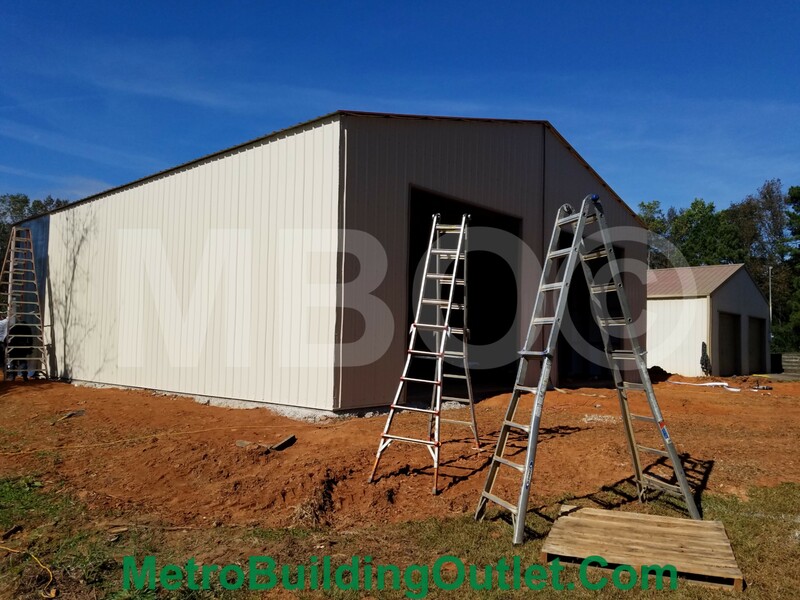 If you have questions you can direct them to 918-258-5050 or MetroBuildingOutlet@hotmail.com Let us know your thoughts. House #3 is coming along smoothly! Still in the planning stages. Early floor plans call for 4 bed rooms each with there own walk in closet and master style bath! Tune back in to see more updates. announcement up dates will be posted on Facebook! We are rapidly trying to up the site and should begin adding new itmes and our past best sellers just as quickly as we can . Hi, We are in the middle of a major overhaul of the site and specifically the online store. We are working diligently to make the information about specific items easier to understand and to provide more information about each item. In addition we will slowly be adding a number of new items once we get our best sellers re listed. 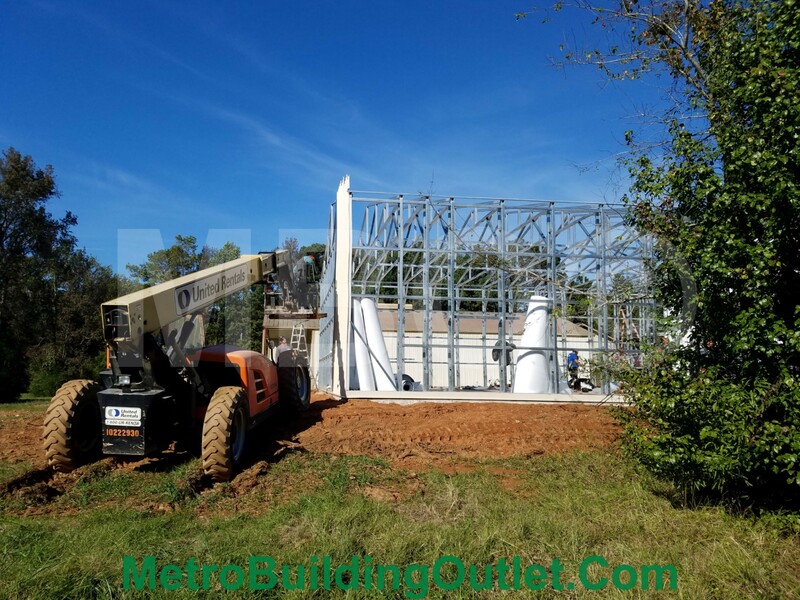 In the mean time Feel free to call us at 918-258-5050 or email MetroBuildingOutlet@hotmail.com with any questions and we will do our best to answer at questions we can. We had a question about color match doors. They are not available in all colors or all states but we can do Pewter, Evergreen, Barn Red and Earth Brown in most areas for an additional $100 per door. It does take about an extra week to get them but they are available. 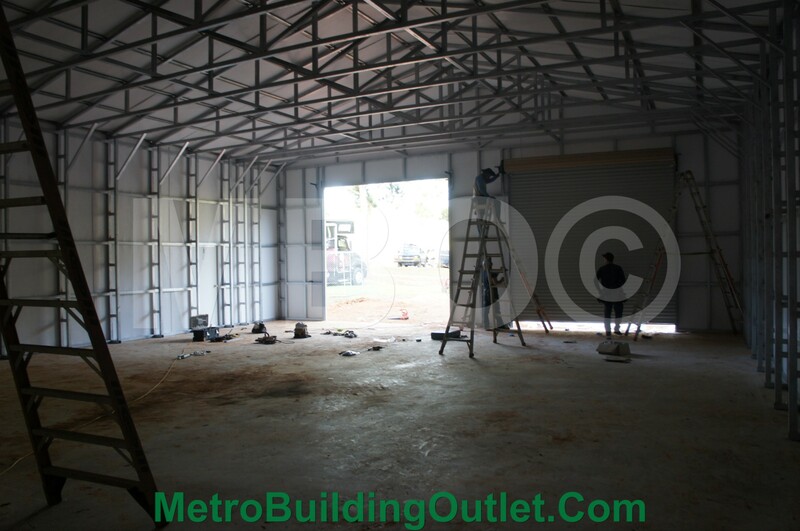 Let us know any questions we can answer at MetroBuildingOutlet@hotmail.com or call 918-258-5050. Our biggest question of the week. Are prices going to go up with the Tariffs'. Our best answer to that so far is that our largest national competitor raised prices suddenly this week without warning and dramatically. So far so good on our end. We have a considerable supply in stock as does our primary bulk steel provider. That having been said we simply do not have enough answers as to what is going to happen or how this plays out. In the mean time if you have been putting off placing a deposit because of weather or concrete be aware we have had a lot of deposits that were made this month purely to hold a place in line so if that is all you are waiting on just remember this is the time of the year the lead times go up rapidly and just because we said in January that we were at 3-4 weeks in your area that will not be true in May and June. If you have any questions about lead times in a specific area call the main line and Chris, Jeremy or Terri can usually get you an up to date lead time as of that day. In most areas today it is 3-6 weeks except for NY and NJ where we are still fighting the longer than expected freeze and in South East Texas where a lot of people are replacing flood damaged buildings. Other than that if there was ever a time to order it is now! Let s know if we can answer any questions. We do not have very many pictures but this a pic of the wainscoting in the King blue. It has been available for awhile but it is nice to see it on a building. We will try to get more up as we get them. We have just posted a few of our early floor plan ideas. Right now it is just the initial 1200 square foot ones with some possibilities for porches or a garage. Let s knw what you think and stay tuned as the 1500, 1800, 2100, 2400 and 2880 plans are soon to follow. Also if you not seen it already we will sale price anything ordered this week down 5% on orders over $4000. Orders need to be made in person or over the phone. Hi guys, I am sure most people are aware that we are experiencing an unusually amount of cold and wet weather. Please bear with us as it is going to cause delays in places where are currently unable to work. The good news is even with sudden delays and rescheduling we are on average 2 weeks ahead of last year and even further ahead of 2015 and 2016 so the news is really not bad. We also want to take a moment to show another example of our commercial uprights now available in on all buildings and standard on 15 tall and taller legs and any building over 30 wide. This is going to allow up to do so many things that we have been unable to in the past and it is really exiting to be getting the first pictures back from the many orders last fall that are finally complete and in use by customers. Let us know what you think. Just sharing some other ideas. We are just taking a minutes this month and next to share some interior ideas. Not all of our customers projects are worth y of cable TV home improvement shows but there are a lot of stand outs. We are committed to designs that maximize square footage per dollar so that you do not spend your money on a showy exterior and then mot be able to budget the quality interior you really want. 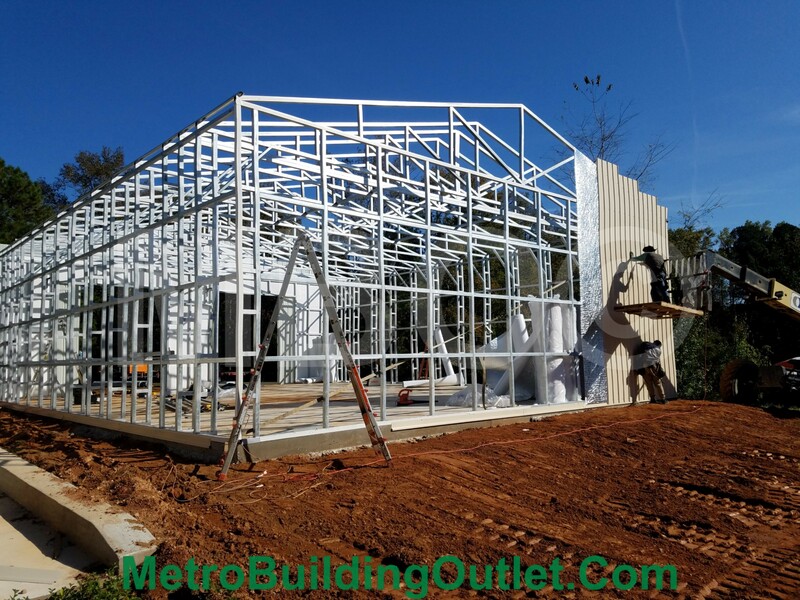 Galvanized steel homes are all about shifting your dollars inward compared to traditional structures. We also have redoubled our efforts to simplify and cheapen the finish out process. 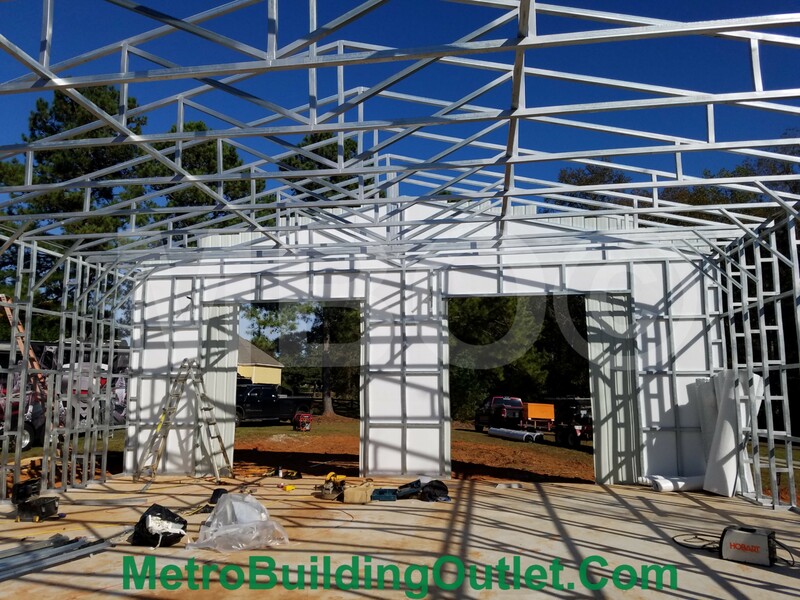 We have added cross bracing on all vertically sheeted structures to assure that installation of insulation and dry wall is as easy or easier than in stick built construction. Now in addition to our standard 4 foot stud spacing we are offer 24 inch and 16 inch centers still with our 34k and 54k tensile strength frame members. Remember that our 4 foot on center construction was already guaranteeing 140 mph wind loads and 40lbs./sq. foot snow or live load. With these new additions we are expecting to see Hurricane winds fail to have an effect. There are so many new things going on at The Building Store and we will be sharing more and more over the next few weeks. Enjoy the pics below and check pack in as we are going to add several more in the near future. We talk a lot about the weather being the number one factor in installation times. The weather is a two edged sword for us. While the ground is frozen up north the time it takes to complete orders, especially those on the ground is greatly lengthened. On the other hand this frees up crews to play catch up in the South. This is also the slowest time of the year, so while lead times in the North are the longest they will be this year the opposite is true in most of the Country. For those getting ready to order in most states this will be the shortest wait time of the year. As of Thursday we were average 3 weeks nation wide so if it is not below freezing where your at this is probably the best time to get your order in the shortest time. If you are still waiting up North we are working hard to get to each job as quickly as we can and have both crews and schedulers working over time to get every order filled. We are super exited to announce our all new lap siding. 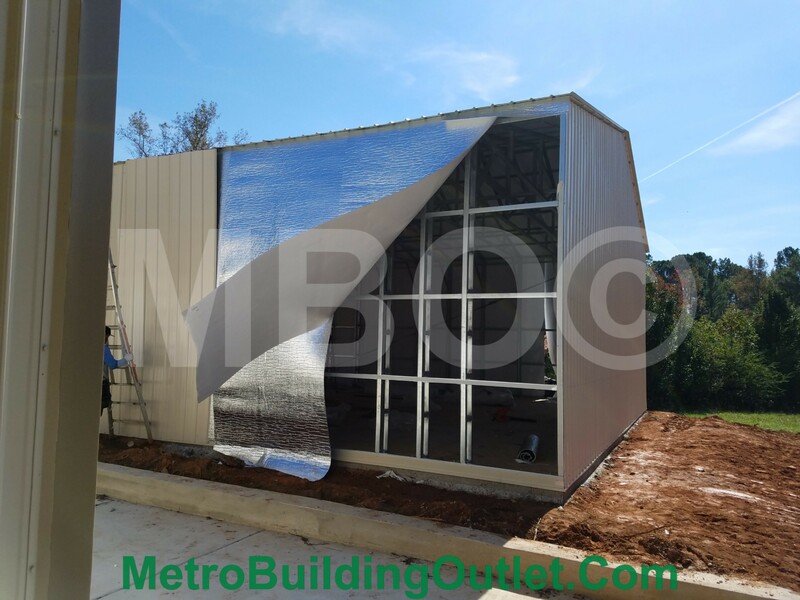 It will be priced the same as the vertical sheeting and in addition to being a little stiffer than the traditional panel it gives a very professional and finished look that is very different than the horizontal or vertical sheeting. Also wainscoting is free just as it is with the traditional horizontal sheeting. 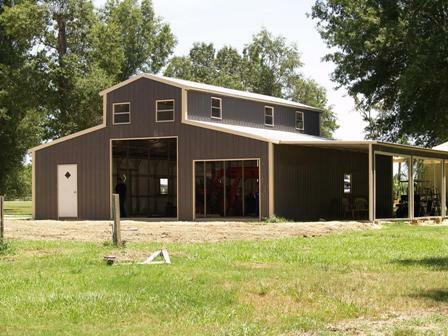 We have been very focused on or steel home projects but we do not want anyone to think we forgot about barns. This is a 66x40 commercial horse stable that has left nothing left out. The guys are still working out all of the options but as seen it should be around $84,000 installed. Obviously as with everything we do, we can make whatever changes you see fit to make sure it fits your needs. Let s know what yo think. This video with sent to us form one of our customers for Missouri. Thanks! We have a lot of exciting things going on. First we wanted to share the image above. So many people have asked if we can support a second floor. This is to give an example of just what we are dealing with in terms of up rights. When we do a two story structure we suggest 2 foot on center. We are also very exited to be able to say that we now have standard 170mph wind load ratings on all structures 32 foot and wider. We are also exited to see a lot of new interior designs from very simple and cost effective all the way to custom luxury living. Here is the first image of our 2nd official home design that will incorporate an integrated instead of separated garage. We also added a reverse peak porch that may become an option if it is poplar enough. This is only 60 long instead of 75 so it is going to fit in a lot of places the first one will not. Special mention to John S. who just recently purchased a variation on House #1. Let us know your thoughts? Our digital show room is coming along a little slower than we thought, but one our most poplar designs is now included. This is affectionately known in the office as Barn#009 and is basically a 36x40 with a raised center and a lean to. We are always trying to help people visualize the structure beyond the dimensions alone. We will be adding these directly to the catalogue as they are completed. This is also going to help immensely in trying to determine floor plans and showing customers the best plans for finish out. Barn #009 36x40 with lean to. As promised here are the first of many sketched of or DIY steel homes. This is a basic layout we rendered that can be done for less than 50k. 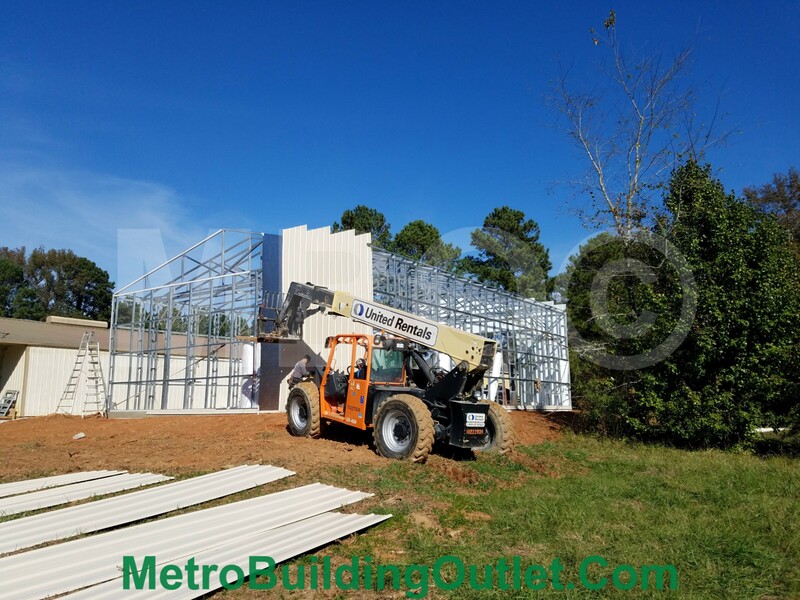 You provide the slab and the interior finish out and we provide a certified 140-180mph wind load steel frame that far exceeds the strength and durability of wooden construction. We will also be able to provide a variety of interior walls both load bearing and free standing to accommodate finishing out highly flexible floor plans. Here we even had a little fun and rendered in Hard wood and tile floors. We do not do flooring but are going to render full interiors just to give people ideas of what is possible. Let us know if we can answer any question. Just a teaser for now but imagine 2400 square feet, vaulted ceilings, 900 square foot garage, 3 beds and two baths as a bare steel shell for under $50,000 installed. We will have a lot more info soon so stay tuned! How about a 4200 square foot house with a 4 car garage and wrap around porch all hidden in galvanized steel barn with 140 mph wind load? We just got these concept art photos from one of our employees. It is just an idea of what could be done based an easily feasible barn. 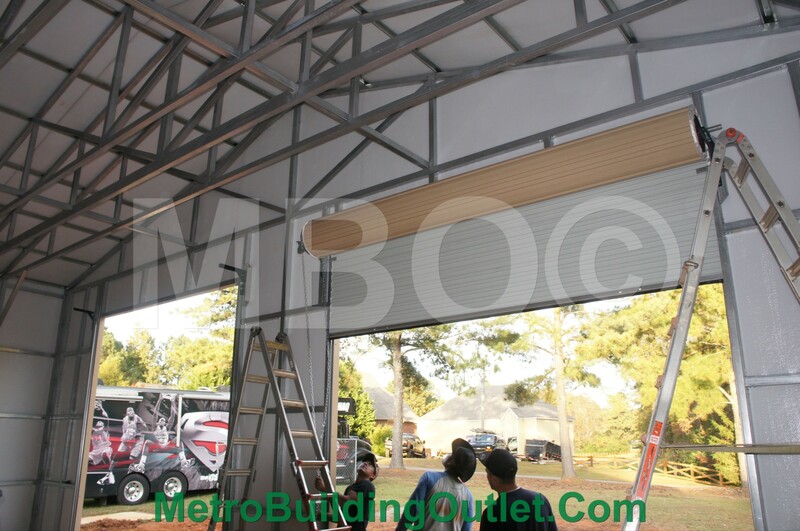 We can provide all kinds of strctures built on 4 and even 2 foot centers to facilitate easier finish out and while we do not provide electrical or plumbing we can insulate and frame openings as well as provide rollup doors and windows. Here are a few more. Here is a cutaway of the luxury interior. Anything can go inside when you have wide open space and easy attachment points. We are continuing to take orders for an ever increasing number of barndominiums. The most common combination looks a lot this one here. 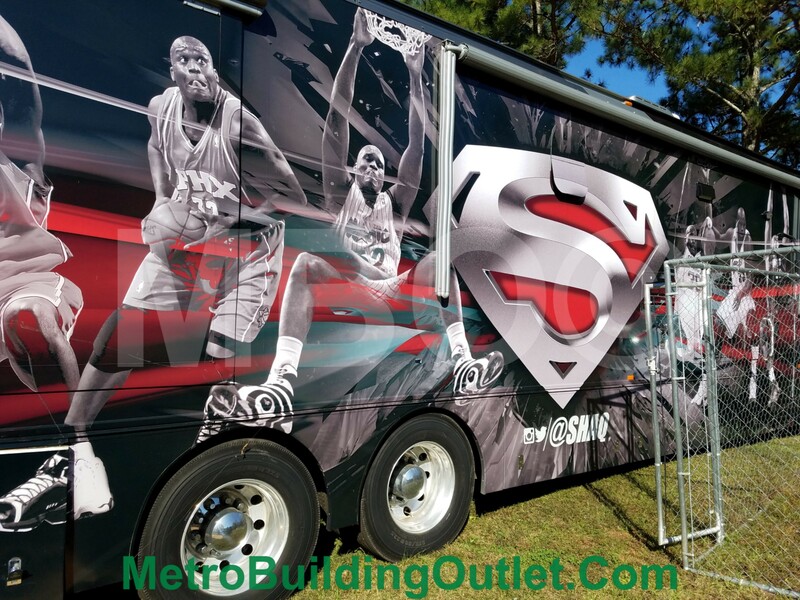 We can customize with different doors or windows or add porches to any or all sides. We build on a four foot center but we can upgrade to a 2 foot center to accommodate installation of insulation and dry wall or other finish out. The one you see is a 48x50 with a 16 foot center wall and 10 foot outer eaves. It could of course be used as a shop, garage or barn as well. Just as seen in runs between $25,340-28340 depending on the local building codes we need to adhere to but it starts with a minimum 105mph wind load and can be upgraded to 180mph if required. Similarly we start with 30lb./sq.ft. snow loads and go as high as 65 for northern states. 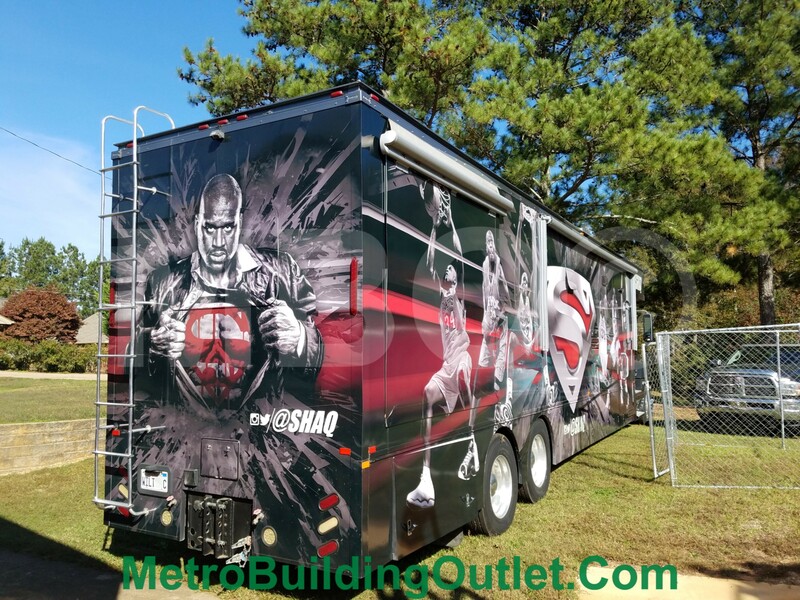 As always send your questions to thebuildingstore@otlook.com or call us at 918-258-5050 and don't forget to click on the link below the photo to get more details or browse our other selections. Some exiting announcements from or engineering staff. As of now we have changed all of our designs from minimum 90 and 130mph wind loads to standard 105 and 140. Florida is still 150 and 180mph as always. In Northern states we have also upgraded to 65lb. snow loads standard and 105mph wind loads. These changes have taken more than two years to implement and included retooling, new drawings, and a lot of heavy lifting and retraining but they are now implemented in all markets. In some cases the changes let to slight price drops at certain sizes but in most cases there will be a small price increase. Be aware that these changes are being updated on the website as rapidly as possible but any price that does not show a September 2017 update may not be accurate. We should have everything updated in the next few weeks. Mostly we are just very proud to announce the improvement to or product and happy to be able to provide the industry standard in engineering and manufacturing excellence. We have had a lot of questions about lean times and scheduling in Orlando and Houston. To everyone that as an order in South Texas or Florida please bear with us. The safety of our crews must be kept in mind. In most cases delays are not significant but if your area still has standing water or if the storm has not hit you yet expect some delays. At least two of our production facilities at in the direct path of the storm and we will not know the full extent of the effects for several more days but we will do or best to keep yo informed and to shift work to or other 5 production facilities to limit the delays. Thanks for you patience and stay safe out there. Learn more about this Barn! All the way to some rather involved commercial operations that required a little more planning. We have a variety of 30 wide Barn and Garage Designs. A really common question is about what are the "standard sizes"? While there are not necessary standard sizes per say, there are definitely a few common sizes that make for the optimum cost per square feet. Specifically 18, 24 and 30 wide trusses represent the ideal widths/$. Similarly 12 foot add ons are a great way to maximize space/$. The building above is an 18 wide with 12 foot lean to running the whole 40' length and an additional cover extending 12 additional feet. We have been answering a lot of questions about frame gauge. I know we have touched on this before but to just quickly recap on the subject. While frame gauge is important it only tells part of the story. 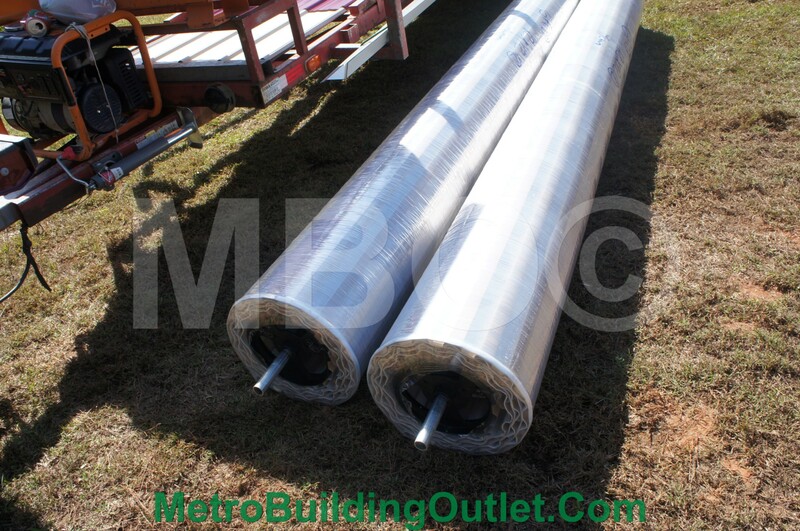 Typically tubular galvanized steel is cut from either 14 or 12 gauge sheet. 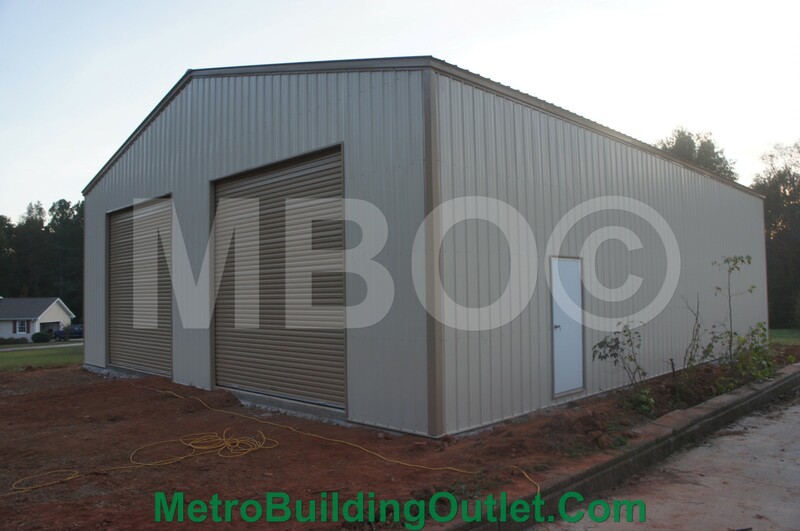 Depending on the supplier the steel may vary galvanized painted or left bare. We obviously believe galvanizing is the best answer when it comes to corrosion prevention. Many manufacturers proudly tout their 12 gauge tube as being stronger than their 14, but how strong was the 14 to begin with? We start with a 34,000psi sheet to begin with and se only cold rolling in our mandrel bend process to assure that we do not lose any of the strength by heating it. We then make the 12 gauge from a 54,000psi tensile sheet. When searching for a material provider years ago we shopped around and typically were quotes tensile strengths of 10-22k psi. The highest we have ever been quotes from another manufacturer of galvanized steel was 28k psi on a 12 gauge tube (and yes they are a major house hold brand). Many of the manufacturers we shopped could not even give s a straight answer. One major national brand actually told us that they just bought steel wherever they cold find it at the time and just tried to buy the cheapest supply they could find to cut costs. They admitted at that time to using 3 major sources and several smaller ones with no particular rating. We thought that bordered on the fine line between negligence and recklessness. 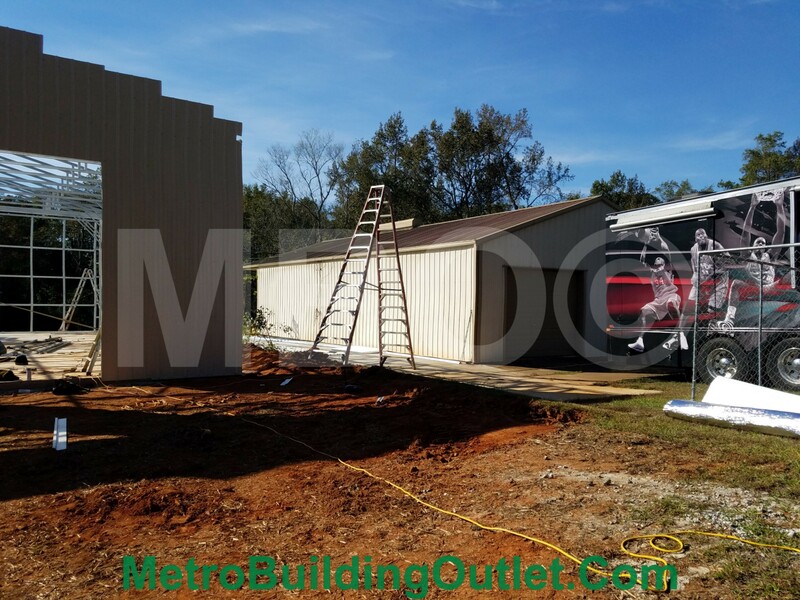 For the last decade we have sourced all of or material from Carolina Carports incorporated in Dobson North Carolina. Our management has toured the main plant in North Carolina and seen their mandrel bending and three parts galvanizing process in person. We maintain a close relationship with them and now they stand by their 20 year material warranty. If you have any questions send them to thebuildingstore@hotmail.com or call us at 918-258-5050. This is a concept model sketched up by one of our staff. He is literally beginning a plan to turn one our buildings into his future home. This is a 20 foot side wall 96x80 5 section barn. We priced it out with variations options for anything between $79,000 all the way up to $144,000 depending on frame gages, levels of wind certifications and the degree of insulation we added. Its just a cool project we have been keeping an eye on and a great example of what is possible. Looks like it is missing a few windows! Happy Cinco De Mayo! We have been incredibly busy lately, but I wanted to take a minute and talk about concrete. Due to our huge service area we are unable to provide concrete. There is a possibility that in a few limited areas that we might know of someone we can suggest, but for the most part customers will need to find their own concrete contractor. We are more than happy to coordinate and provide detailed directions to the contractor once they have been identified and quite often the concrete installer will just calls us directly so we can give instruction. We have gone to great lengths to tailor our products to ease install on any surface. Unlike most building methods where posts are set in the ground, we are laying a base rail which provides the foundation for everything else we build. This has the added benefit of letting us install on basically any level surface with the addition of drip rails, vents or fancy approaches. While we can install on a thickened edge it is not necessary and we do not have to overlap vertically because we are essentially overlapping the whole foot print 3/4 of an inch in all directions which greatly decreases the chance that water can come in without any special considerations. Let's pretend we are doing a garage 24x30 with a 31 foot roof overhang. All we need is a 4 inch slab 24x30. Nothing else. This does not mean that you may not want to make it thicker, or that your local code will not require a thickened edge or footing, but we are only using the first 4 inches to set our anchors. This also facilitates the ability to build only the footer and leave the center dirt or gravel. This allows you to come back later and finish the floor when funds become available. 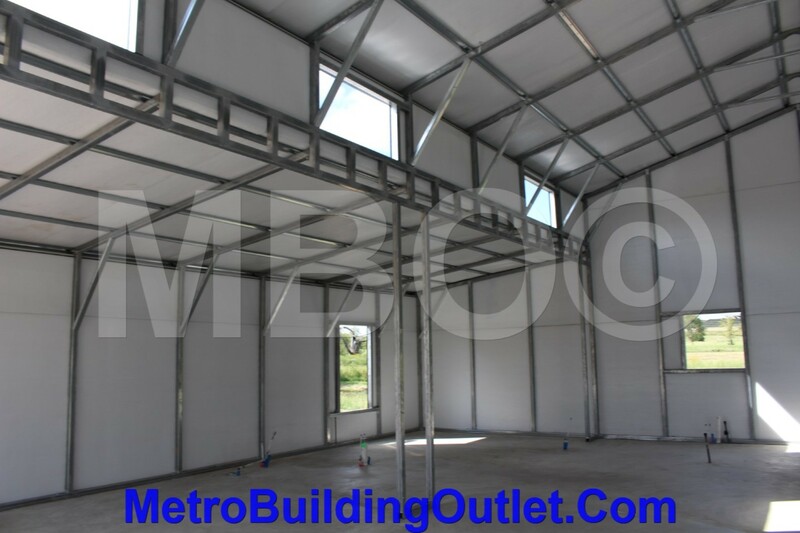 We have been inundated with recent questions about using steel buildings to create living space. Barn houses or Barndominiums are definitely nothing new. It was a huge trend in the 60's and 70's but has slowed over the last 3 decades. Now it is back in full force. We started getting tiny house requests a few years ago and slowly the size of the tiny houses started growing, and growing till they were anything but tiny. 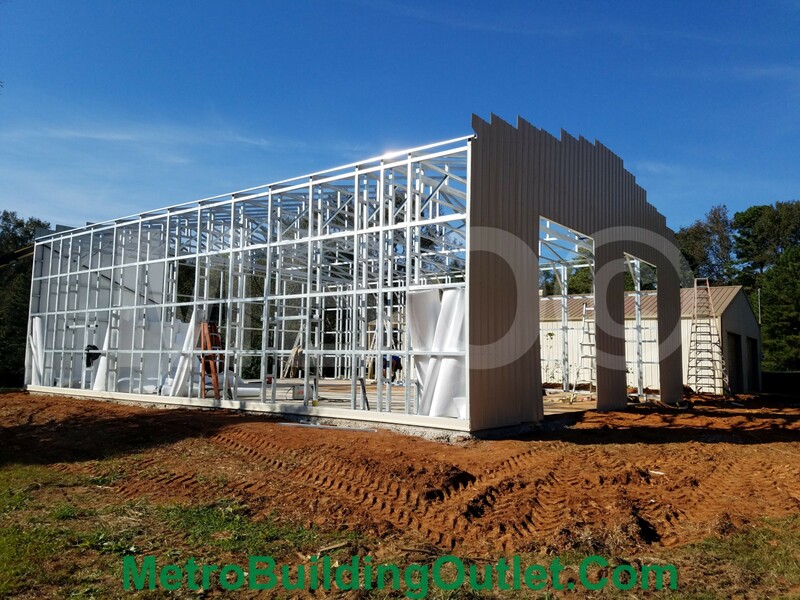 What we are seeing now is larger steel buildings between 24x30 and 60x100 typically with a cross section where one part is garage and shop and the other portion is fully finished and includes living space. A not so "tiny house" but still on a budget! We have seen these range from bare bones, cheapest possible living spaces to luxury homes with indoor swimming pools, custom cabinets and lavish furniture. We instantly took notice! We also knew we had a serious advantage over the competition. Because we build in galvanized tube on relatively small centers (between 5 foot down to traditional 16 inch spacing) we already knew it would far easier to attach insulation, sheet rock, hardy board or wood work to our frame as opposed to the red iron on spacing that is too far apart for standard materials and very difficult to attach to. We were seeing photos of red iron warehouses with entire wooden shells being built inside to facilitate dry wall which was essentially defeating the entire purpose (lowering costs). They were literally building a building inside a building and consequently raising the price purely for the sake of style. I googled barn house and found this image right away. It appears to be quality work, but also appears to be a lot of wasted effort. Why build a building inside a building if you do not have to? With our material being available at the proper increments it would allow customers the ability to attach directly to our frame which has the added benefit of adding rigidity to our already very rigid structure. Here is one of recent projects that also included custom windows and exhaust fans. It is going to serve as a bird aviary and required a lot of special considerations. Oh and Spray Foam! Later it got this custom floated floor. Next came the addition of spray foam. This was a game changing product for the whole industry. Not only does it have the highest R value (the rate at which heat radiates through a surface and how much of that radiation is blocked by a certain material) of anything on the market it also conforms instantly to any shape. It also quiets and seals everything against moisture and corrosion as well as cancels out vibrations and noise transfer. I will do an in depth article in the future on the value of spay foam and which type (open or closed cell works best for different application). In the mean time just know that despite the increased cost, if you are planning a living space, this is what we suggest. That left wooden structures. In the past few years wood prices have skyrocketed! In some areas as much as 300% since 2011. At one point we really had to work to get the message across that steel is always going to be stronger and more resistance to water and fire damage as well as bugs and termites than wood ever could be. We were hearing people tell us they could get a building the same size 10-20% cheaper. But with the soaring wood price increase we more often than not can achieve an apples to apples size building cheaper and also on tighter frame spacing. Not only that though, like the wood building a customer can go in on day one after weleave and start the finish out. Another huge advantage to this type of construction is the ability to build in multiple phases as funds continue to be available. Especially in the case of vacation homes or secondary residences we are seeing people start with a large shop or barn that is bare inside. They typically have saved up for it or are in the process of paying it off. Later after it is paid off or additional funds are saved up a small portion may be enclosed and completed often over months or even years and often in many stages. Another thing we are seeing a lot of is customers who buy a rural or lake property and build a shop or barn and then slowly finish it out until the point is it livable before selling their primary property. This is often in conjunction with a retirement or the last of the kids leaving home. One of the best parts is that this really fits into a full spectrum of budgets. The above structure is under $13,000 as seen. If we estimate a liberal $8/square for concrete we are up to $24,000 with all doors and windows enclosed. We now have a shell ready for finish out with a 960 square foot interior and a 288 square foot covered porch for Under $25,000. Trying to do this with traditional building materials would be unthinkable and it has a 140mph guaranteed wind load and a 30 lb./ square foot snow and live load that automatically meets or exceeds code in most areas. The picture at the top of the article is smaller and cold be done for less than 20k with concrete. As the buildings get bigger the cost per square foot will continue to go down but these two are averaging $17.36/ square foot. In addition to that customers can save by doing all their own work or hire professionals to achieve the exact look and fit they want. I will continue to share more information and pictures as time goes along. In the mean time send me questions, comments or even criticisms to me at Questions & Comments because I don't know what to write about if you don't tell me. And if you are in the market and want a quote either email thebuildingstore@hotmail.com.com or pick up the phone and give us a call at 918-258-5050. The first thing we want to say this morning is to take a moment to remember those lost on this day in the tragic OKC bombing. You will never be forgotten. This is a very busy time of year for us. Typically we have a quiet time starting around the 1st of the year when people are still trying to catch from the holidays and are not thinking to much about construction projects while it is cold. But this year that did not happen. We have continued to be saturated with inquiries and orders even before it started to warm up and now with spring in full effect people are coming out of the wood work to get their projects started as fast as they can. Cars, bikes, boats, RV's trucks and ATV's are out in the elements or people just do not have adequate storage and the time to fix it is now. A lot of people think it is to late in the year to order for this storm season. Its not true. We have worked harder than ever to keep our lead times down as fast as possible by hiring more full time crews and running longer shifts at the 7 plants. Because of this effort our nation wide average as of last week is steady at five weeks and that is factoring in very long lead times in southern Florida and Northern Kentucky (but we are whittling that down as well). We are hopeful that barn and shop orders placed in April will be complete by the end of May or Earliest June at the latest in most markets. For commercial projects expect that to be even faster because they require less shared transportation requirements and can often keep from sharing shipping costs with other customers. Rest assured that we are doing everything we can to get your toys and possessions or your companies inventory and tools out of the elements as fast as we can. It is also important to remember that while wind and hail do contribute to more immediate damage, the number one element effecting your vehicles is the sun. Solar damage is the number one consideration and in the summer months your vehicle is more susceptible to solar damage than at any other time of the year, so the earlier you get them covered up the more protection you are getting. Please send in your Questions & Comments and I will do my best to answer all of them as quickly as I can. We thought we would take a minute to say hi and hopefully share some things we have learned from nearly 2 decades of construction around the United States. We hope to make the building journal an easier way to inform our customers about the possibilities, methods and philosophy behind our construction and the process you will go through as well as hopefully educate you as a consumer to give you a better understanding of construction as a whole. 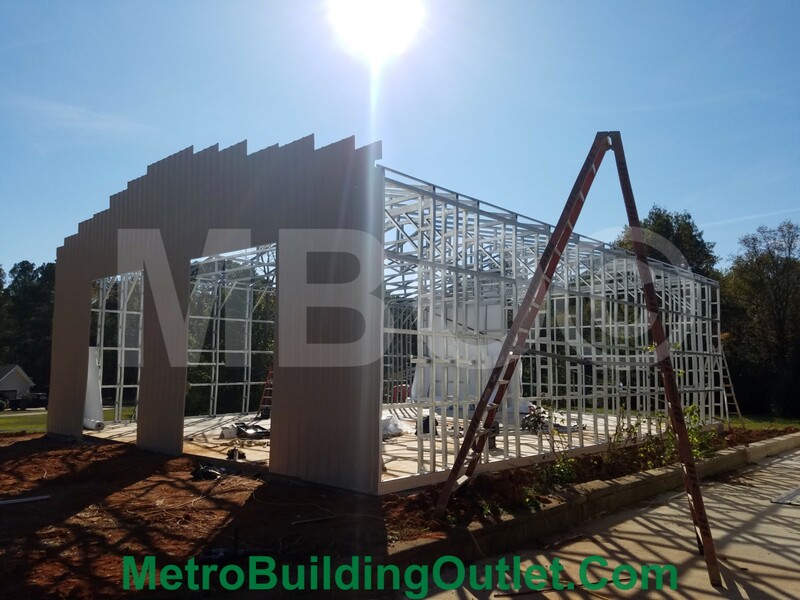 Despite the fact we currently on only build using all galvanized construction we do have years of experience building both red iron and wooden buildings around the country and want to inform buyers of the pros and cons of each and why we ultimately chose to exclusively do galvanized construction. 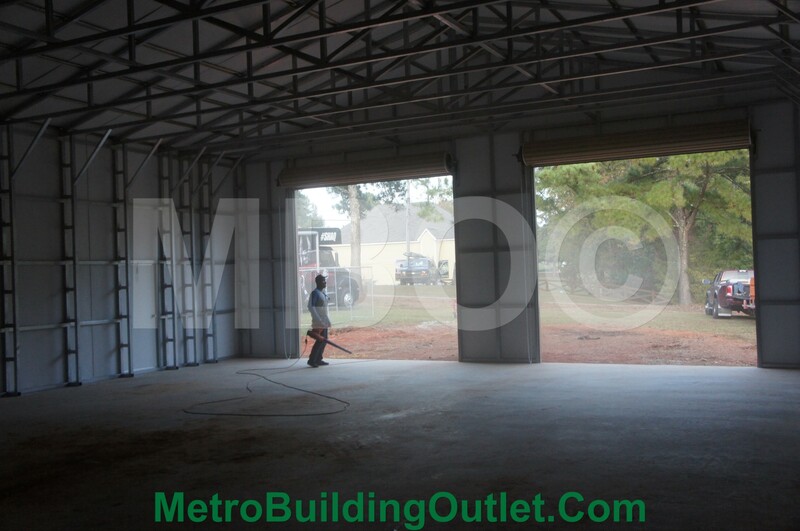 The biggest thing we want to do today though is just say hi and welcome you to Metro Building Outlet. We invite you to browse around and hope you will return as we make updates weekly to keep the latest information available to our customers. Also please like and follow our facebook page Facebook to see the most up to date photos and descriptions of our latest projects. Thanks for visiting us today and we hope to see you again.